We met because of her nose. My first glimpse was of her wiggling, tail-wagging behind, her nose wedged in a hedge in my mom’s front yard. Nose to ground, she took off, zigzagging the neighborhood, circling trees and lawn ornaments, darting across a busy street. I gave chase and finally caught her after a near-miss with an SUV. She was wearing a collar with no tags. No microchip. 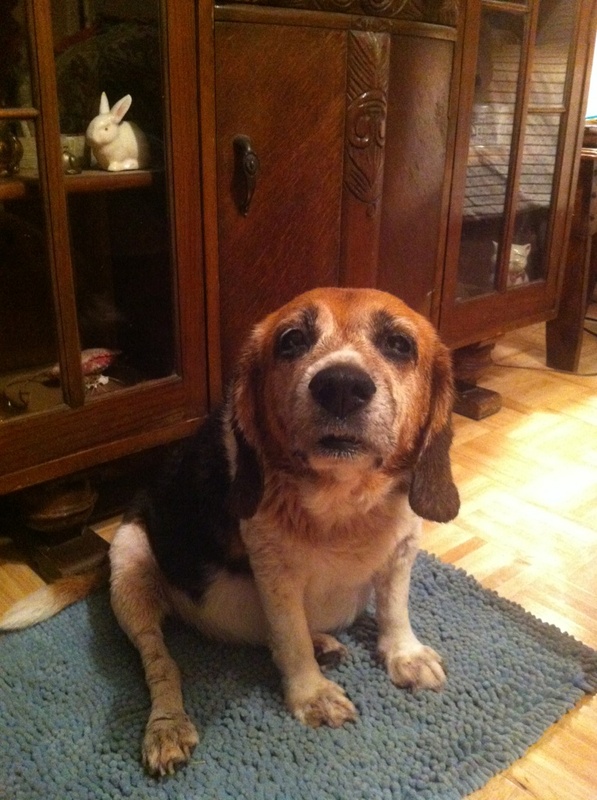 We posted fliers; Listed her with Beagle Rescue. We rapped knuckles on doors, asking if anyone recognized her, knew where she belonged. She trotted along happily, meeting new friends at every house. I called my husband at work and told him I had found a dog — a friendly, tri-colored Beagle with floppy ears — an inquisitive imp that melted my heart with her big, brown eyes and happy-go-lucky personality. “Do NOT bring that dog home,” my husband admonished. It hadn’t been long since we’d added a tiny, gray kitten to our menagerie after she climbed in my lap and purred away an afternoon interview I was doing for a story I was writing. The lady was looking for a home for the kitten she’d found behind a dumpster during a thunderstorm. We also already had a yellow lab/retriever mix named Jake, rescuing the over-sized mutt after his family was killed in a tragic auto accident on I-35. Famous last words. No one called from lost pet websites. The fliers came down. Our 8-year-old daughter fell in love with the little dog who raced around the backyard and chased balls that would, inevitably, land over the neighbor’s fence. We named her Pixie, because of her blythe spirit; her friendly, sweet and energetic personality. Chasing squirrels, she took to climbing the tree in our backyard. I was shocked the first time I looked out the kitchen window and saw the beagle balancing on a limb, high as the electric lines. The squirrels chattered and complained. Pixie bayed and barked and, finally, climbed down the way she came, tail wagging, pleased with herself. Pixie was my husband’s walking companion and, together, they logged many evening treks. She was stubborn, and when on a scent, would not alter her course. It became a joke of who was walking whom. When tired, Pixie would plop down and refuse to go further, planted and panting. My husband picked her up, cradling her like a baby for the walk back home. Pixie loved holidays and Halloween. With each ringing bell, Pixie trotted to the door, greeting each goblin or Princess, wagging welcome in her Hot Dog Costume. She made us laugh. She infuriated us. She charmed us. The dog that wasn’t supposed to be ours had wiggled her way into our hearts. Our daughter grew up with Pixie, her childhood pal. Our daughter just turned 20. The vet thinks Pixie to be at least 12. In recent years, she has slowed, her fondness for treats adding girth to her Beagle body — her once-trim waistline widening — like many of us who find ourselves mired in middle age. Not as lithe as she used to be, her waddling body betrays her feisty personality. She becomes cold-sensitive, shivering in her Beagle bed. We swaddle her in warm blankets and buy cozy sweaters in stripes and argyles. She struts in Scotch plaid. Pixie’s eyesight starts to fail, a cloudy film covering her inquisitive eyes. Special drops help, but soon she is seeing little, if at all, according to the vet. She maneuvers and navigates with our help — her stubbornness and keen sense of smell helping her adjust. She still plops in the middle of her blue kiddie pool to cool off. Still asks for treats. Still has an appetite. Still barks whenever my husband leaves the room. At night, he tiptoes out, clicking the door shut behind him, like we used to do when our daughter was a sleeping infant. We try not to wake the sleeping Beagle. If Pixie hears my husband in the next room, she stirs, barking until he comes back. Maybe it’s the dark she is afraid of now. From the room, I hear my husband shushing her and talking in a soft voice, just like he used to do with our baby daughter. It is he who can calm her. It is he who makes her feel safe. Pixie no longer dashes from tree to tree. Arthritis slows her and more medications help ease the pain. She loves warm baths and being wrapped in soft towels. Out of the tub, she shakes and prances, regaining some of her youthful exuberance — The busy tail wagging her Beagle bottom. In recent weeks. we see her slow, have more pain. Another vet trip. Another medicine. A little hope for a little more time. Last night, we gave Pixie a warm bath and sat on the bathroom floor with her. In recent days, we could see her failing; steps slower, breathing harder. We toweled her off, gave her cool water to drink, hid her nighttime medicine inside a hot dog. She gobbled it up, sniffing for more. “Should I get her another one,” my husband asked. “Yes, yes, get her another one,” I said, sitting cross-legged on the floor beside a Beagle I once chased around the neighborhood, through hedges and rose bushes. I held the little dog close, told her I loved her and how lucky we had been to have her as our pet. I knelt close. hugged her, talked to her, saying the words I needed to say. My husband brought in the second hot dog. Pixie gobbled it up, licking his hands, quieting at his touch. Together, we settled her on her bed, petting, soothing, as her raspy breathing eased, and Pixie settled for the night. Sometime in the dark, our little dog left us. We found her this morning, as if sleeping, peaceful in her little bed beside ours. We hope she had no pain. We hope she simply slipped away, easily and gently. We hope she is, somewhere, roaming green fields, chasing squirrels and climbing trees. We hope she has treats and warm sweaters and our love surrounds her on her journey. “She had her issues, but I really loved that little dog,” my husband admits. It is these words that comfort me. Isn’t that, after all, what love is about? Despite our issues, our failings, those who love us do so without hesitation, without condition. For those we love — the issues, the failures, the mistakes, the imperfections — do not matter. Love. After all else, love remains. Yes, we all loved you, little Pixie. Thank you for being ours. This entry was posted in losing a pet and tagged animals are family, beagles, dogs, grief, losing a pet, pets, pets as family, rainbow bridge, rescue animals, when you lose a pet. Bookmark the permalink. An Arf ly Arf ly touching story about man’s…and or wo-man’s best friend. I have no doubt that when Pixie wander up to talk to Jesus’ Daddy… a hot dog and a bowl of cool water were waiting.